All aboard the Santa Express! Featuring Santa Claus himself as the engineer, this delightful counted cross stitch design by Dimensions will charm young and old alike. Finished size: 10" x 10". Illustration by Simon Treadwell. Courtesy of www.image-source.co.uk. Counted cross stitch kit includes: • Presorted cotton thread • 14 count light blue Aida • Needle • Easy instructions..
Take a step back in time and visit our Toy Shoppe for unique gift ideas! This nostalgic scene in counted cross stitch from the Dimensions Gold Petite Collection will add a classic touch to your holiday décor. Size: 6" x 6". Designed by Jim Mitchell. © Jim Mitchell Advocate-Art. This counted cross stitch kit contains: • Presorted cotton thread • Metallic thread • 18 count white cotton Aida • Needl..
A quaint village casts a golden glow in this Winter Celebration design from Dimensions. Skating, sledding, and tree trimming are featured on this Gold Collection counted cross stitch piece that is sure to become a family heirloom. Finished size: 15" x 11". Designed by Nicky Boehme. © Nicky Boehme / McGaw Graphics, Inc. 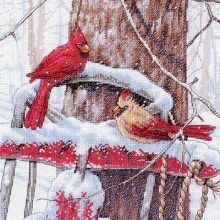 Counted cross stitch kit includes: • Presorted cotton thread • 16 count light..
Winter Housing features a collection of beautiful birdhouses surrounded by warm sentiments. A true reminder of the importance of the holiday season, this counted cross stitch design is sure to be a cherished keepsake. Can be stitched with or without words. Finished Size: 14" x 11" (35 x 27 cm). Counted cross stitch kit contains presorted cotton thread, 14 count light blue Aida, needle, and easy in.. This is a lovely design of a snow-covered forest featuring a brightly lit Christmas tree wih a glowing star on top of it. Several of the forest inhabitants have gathered to admire the wonderous site that graces the woods on this evening. The animals include deer, an owl, rabbits, a squirel, a fox, a racoon and a cardinal. Are they merely drawn to the light? Or have they come together for a greater..